The Committee of Sponsoring Organizations of the Treadway Commission (COSO) released its Internal Control –Integrated Framework in 1992 in response to incidents of fraudulent financial reporting in the 1980’s. Today, the COSO Internal Control Framework is the most widely used internal control evaluation framework in the world and is translated into seven languages. The 1992 framework is currently required to be used by all US listed public companies in connection with their SOX Section 404 certification on Internal Control Over Financial Reporting. 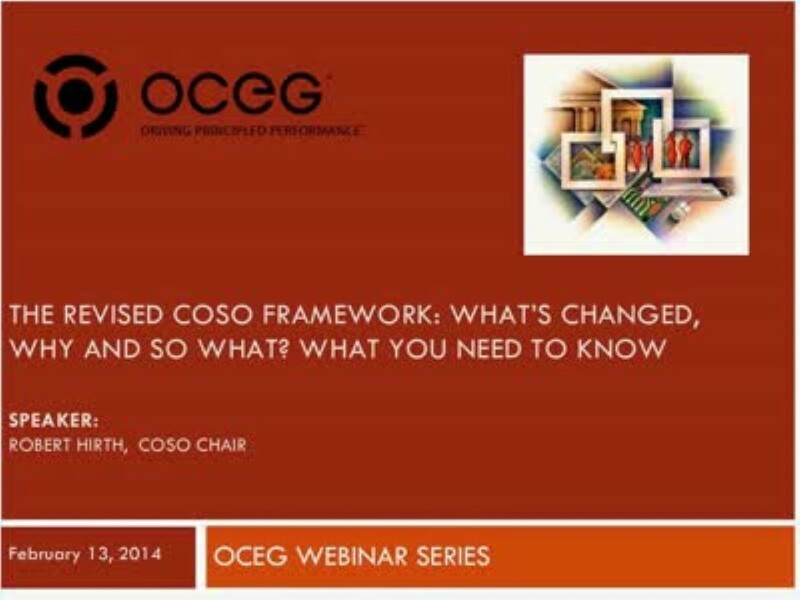 In May 2013, COSO released a revised Internal Control Framework. Suggested transition to the revised framework for US listed public companies is for their fiscal years ending after December 15, 2014, though COSO believes all organizations should begin using the revised framework as soon as feasible. The COSO internal control framework is applicable and beneficial to all forms of organizations: public, private, not-for-profit and government sector, both large and small. We have emailed instructions to access The Revised COSO Framework Whats Changed Why and So What What YOU Need to Know to . Make sure the email arrives in your inbox: either add "support@oceg.org" as a safe sender to your email platform, or if you use Gmail, drag our email into your Primary tab.